What is it with our society's pre-occupation with the left. For example, many think there's a stigma attached to left-handed people. The only stigma is intelligence. From what I've read left-handed people are smarter than right-handed folks. Barack Obama, Napoleon, Albert Schweitzer, Fidel Castro, John F. Kennedy, Jimi Hendrix, Paul McCartney and Prince Charles are all left handed. Well the latter may be the exception that proves the rule. Nevertheless, score one point for lefties. And why are those on the right, and some in the middle, pre-occupied with those on the left and view so called "left-wingers" as a threat? I don't think Al Franken's a threat to anyone other than someone who enjoys good comedy. One more point to the left. And what's with NASCAR. Why do millions upon millions a week tune in to watch forty guys race around a track in what amounts to one big left turn. NASCAR vehicles don't turn right although many of their drivers do. Sheesh, another point for our friends on the left. And now my all time bug-bearer about the left; my pitiful pet-peeve; my #1 maddening mischief by miserable malcontents. Why is it when I go up or down stairs, walk on a sidewalk or bicycle on a bike path people coming towards me choose to ascend or descend, walk or jog, skate or bike on their left? Jesus H. Christ on-a-stick are they all south-pawed, NASCAR-driving socialists. (Boy, now there's a sight!) You're supposed to stick to the right. You wouldn't drive your car on the left side of the road - well except in Britain and Australia cause they're all bloody commonwealth-loving lefties. And why is it I - the one not only on the right but in the right - have to get out of the way and move to the left to let them pass without colliding into me. Is everyone else from Mars? Or some equally vapid place like Britain or Australia. There oughta be a book of rules to help these ignoramuses. You know, like "The Layman's Book of Etiquette for Stair Climbers, Sidewalk Traversers and Bike Path Users". It wouldn't be very long or take much to write it. Hell, even a southpaw could be the author. 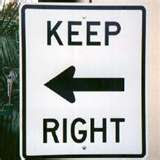 And the title would be longer than the content: "Keep Right!!!" Damn, they've done it again! BTW, folks, today's your last chance to enter our caption contest, Pause, Ponder and Pun. Click thru and maybe you too can say I Be Hangin' With Dufus. Our wiener, eh, ah winner will be announced tomorrow. "Why is it when I go up or down stairs, walk on a sidewalk or bicycle on a bike path people coming towards me choose to ascend or descend, walk or jog, skate or bike on their left?" Why indeed? There's always at least one oblivious biped strolling along on the left. It's puzzled me for a while, but then I remembered: I don't like them. Frank: Maybe you could help me write that manual. People walking, biking or skating on my side of the sidewalk - and who refuse to move - drive me nuts. I'm a lefty who is right, but seldom right when it counts and almost always left behind when the time is right with the left. Simple enough. Don: Are you saying you should have left well enough alone? "my #1 maddening mischief by miserable malcontents." NGIP: I love a little alliteration. John: I lied. I'm watching the rain-delayed Watkins Glen race and they actually go in the other direction and turn right! Imagine. Catholic Nuns, nay, the entire Catholic church hates left handers. trust me. Back in the 1960's at Catholic school, first grade, the nuns taught us all to write. I being left handed, was scolded and pointed out in front of the entire class that all Catholics are right handed. However, I would exact my revenge. lotgk: Yeah, the sisters would have nun of that!